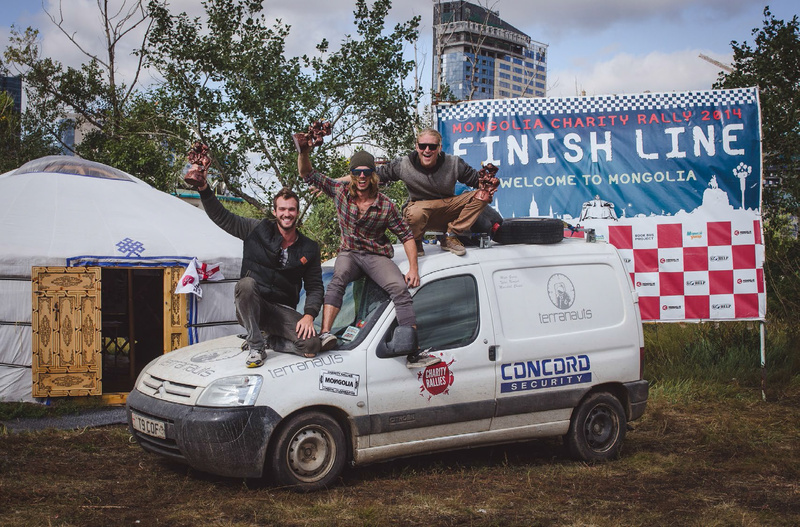 It is less of a race than it is an endurance rally with the sole purpose of making it to Mongolia in one piece and delivering a vehicle to be used or auctioned off by the charity, “Go Help”. One of the prerequisites for entry is to raise money for the charity, who is involved in primary education projects across the country. 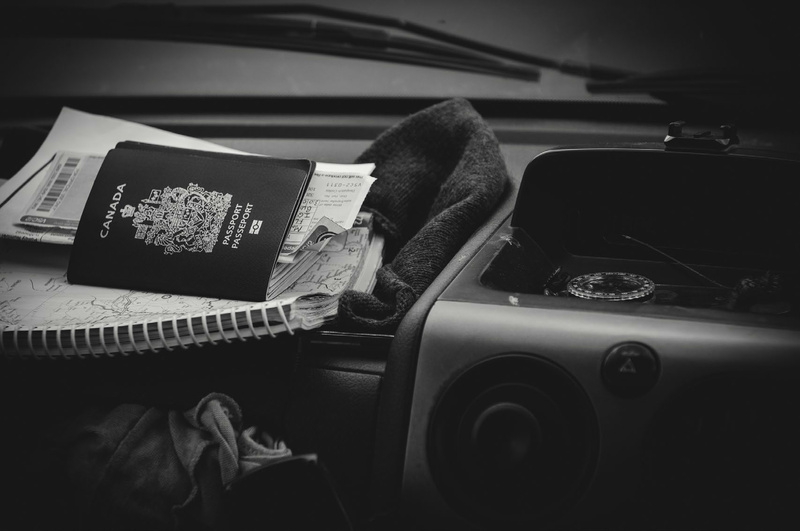 This expedition was nearly two years in the making and involved months pouring over maps, talking to foreign ambassadors, arranging a vehicle to purchase and obtaining visas to countries with typically closed borders. Two and a half months, 20,000 kilometers and 24 countries later, we narrowly managed to deliver our Citroen Beringo to the charity. To keep costs down and adventure high. we chose to camp every night through the trip and cook all of our food. 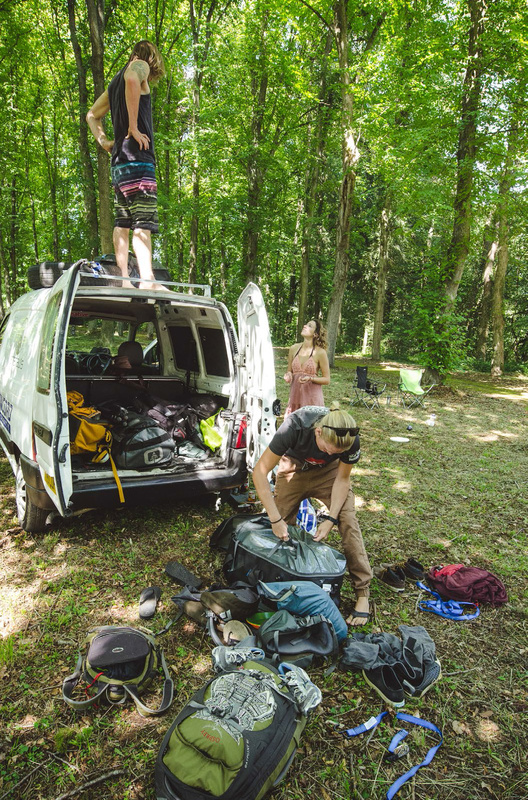 This is a logistical feat when you have to squeeze four people into a small van with gear to support us through climates as diverse as the Swiss Alps to the Karakum desert. This particular exit brought us through the forests of Belgium and to the remnants of a small ancient castle. where we made our camp next to. Lausanne, Switzerland is a mountain playground. Winter provides the locals with access to hundreds of ski lifts, enabling the motivated rider to ski through both France and Switzerland in a single day without even unclipping their bindings. 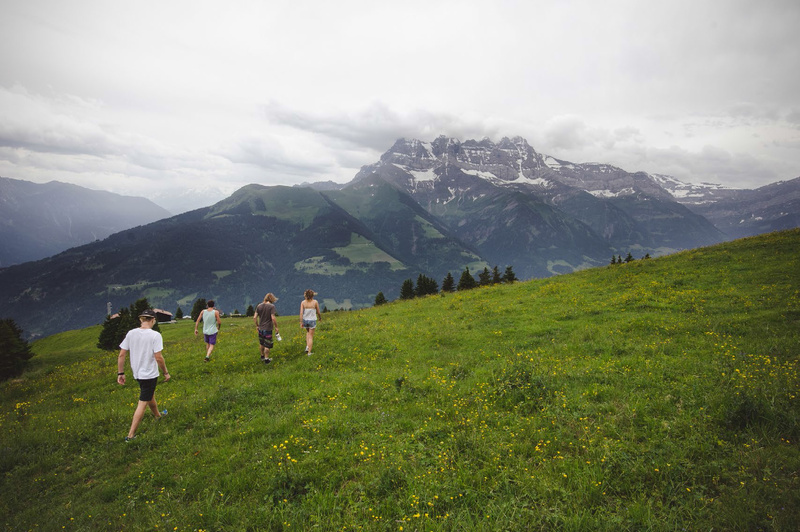 Being surrounded by the towering Swiss and French Alps provides a stunning backdrop for summer hiking through alpine meadows. The roads up to the alpine meadows and iconic villages, such as Grindawald, also provide quite the adventure. Let me say this, if you value your life, then when a Swiss road sign tells you to slow down to 40 km/h around a corner, you better slow down to 35 km/h. The harrowing side roads through Switzerland were nothing short of breathtaking. For people who adore the mountains and the inspiration and adventure they bring, this was a mecca. As we made our way to Croatia from Slovenia, we joked about the possibility of a perfect line between the two borders, where the Slovenian wet forests would meet the hot Adriatic rock strewn slopes of Croatia in a perfectly demarcated line. While we weren’t totally accurate, it was absolutely remarkable how quickly the landscape did change, as if the last mountain in Slovenia held back the pressing and ever present warm winds of the ocean and the creeping scrubby flora of the Adriatic. 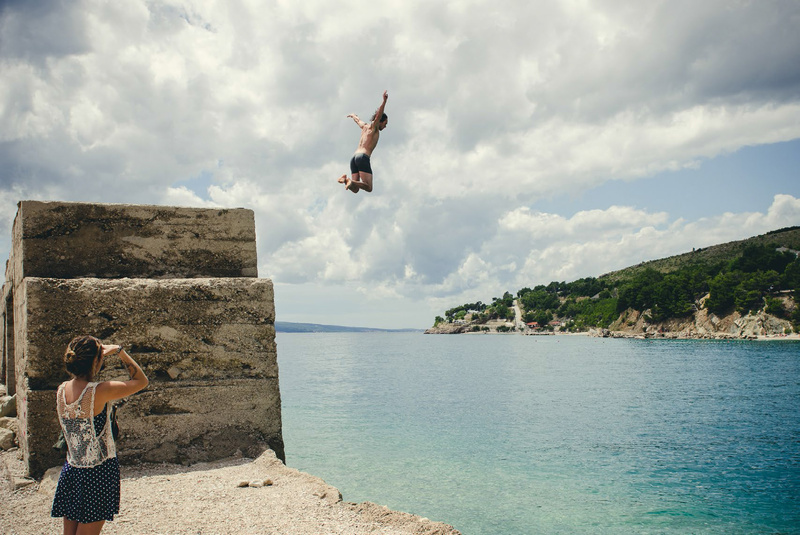 We chose the city of Split to unwind from many days of driving, as it has a higher likelihood of free camping near the sea than its well known neighbor to the south, Dubrovnik. Split is a gorgeous city, absolutely alive and energetic, with ancient ruins of this nearly 1,700-year-old city running all the way down to meet up with the steamy sea. Some of these ruins also provide locals and the odd Canadian with a great spot to jump into the water. 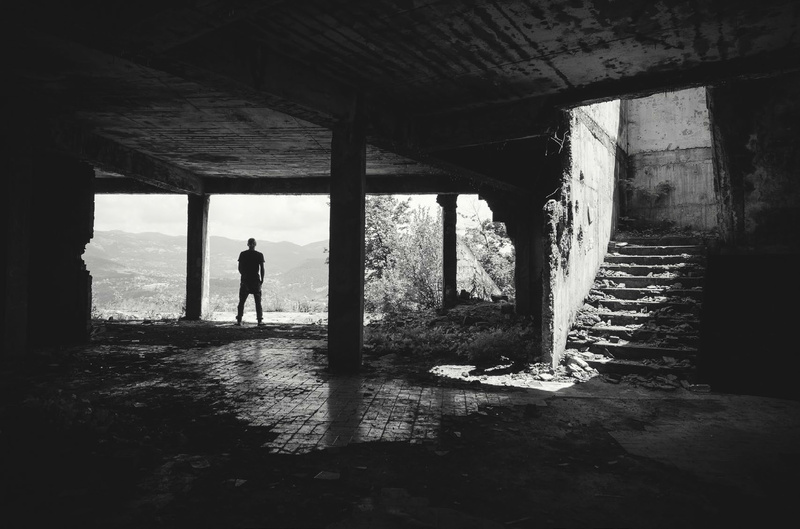 Driving into Bosnia was surreal, we had just driven thousands of kilometers through some of the most developed countries in the world, and not long into the drive we began to see the scars of war: bombed out buildings, abandoned factories and bullet riddled houses. It seems, having driven from end to end through Bosnia, that not a single village or building was spared from gunfire. Waking up in a hostel we found the previous night, we finally caught our first glimpse of Sarajevo from the balcony of our hilltop dwelling. The city, surrounded by misty mountains, sunlight beaming off the red terracotta roofs, the distant sound of minarets making their morning call to prayer, took us by complete surprise. A quick stroll through the old town brought us past little artisan cafes tucked into ancient red bricked alcoves, old men gathered on small stools playing backgammon and drinking tea, the aromatic smell of baklava mingling with shisha smoke and strong Bosnian coffee hanging in the air. Sarajevo, where East meets West. Many hours were spent pushing our van around by hand in the midday heat of an unfamiliar Turkish city looking for a mechanic that could replace our alternator. 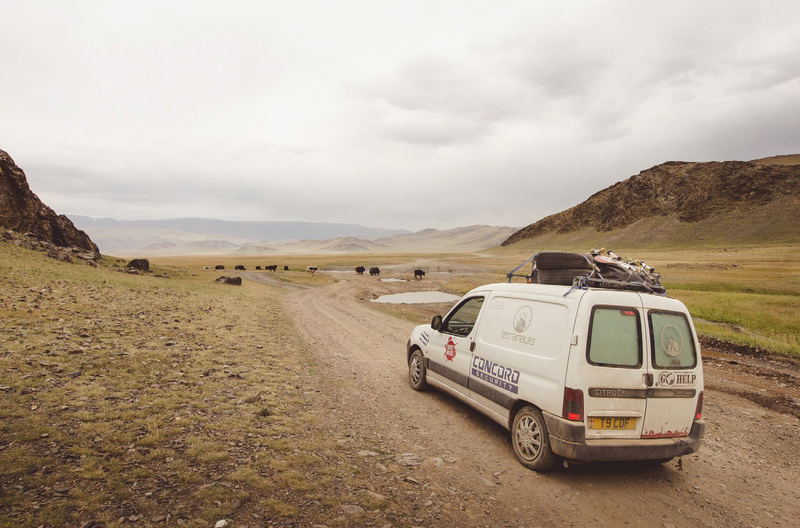 Helpful locals drove us around looking for friends that could locate a part; others even helped push our van. 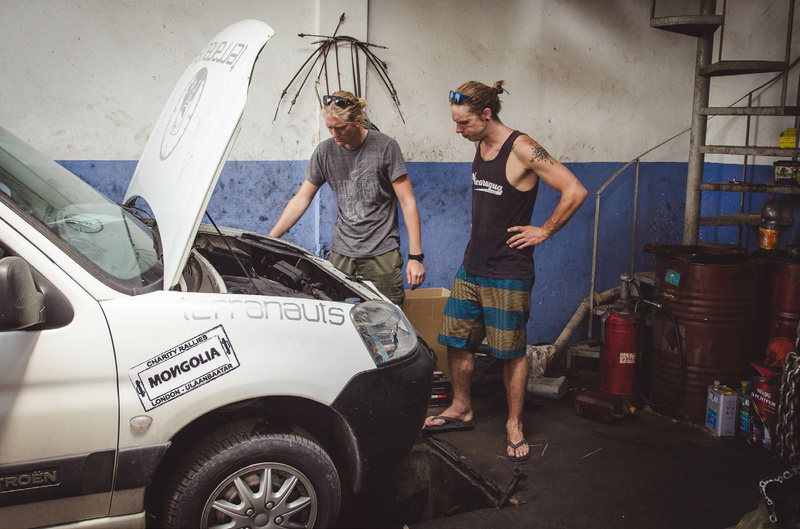 In what had become a concerning trend, we were once again sent off by a group of mechanics laughing at the thought that we were trying to drive to Mongolia. 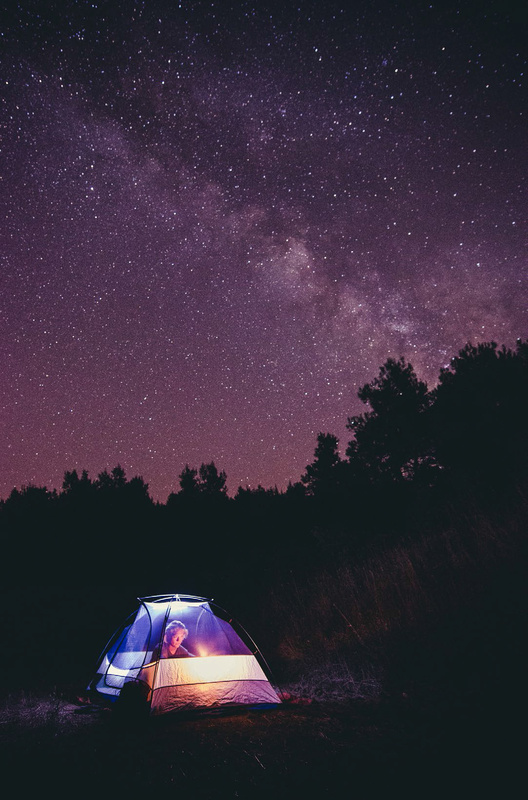 Evenings spent around the tents reading. writing and telling stories. always had a way of melting away the stress of a long day on the road. Olympus. Turkey. a place where idealistic young adventurers back in the 1970’s built tree forts amongst ancient Roman ruins. spread across a deserted Mediterranean beach. A place of world-class rock climbing. diving. 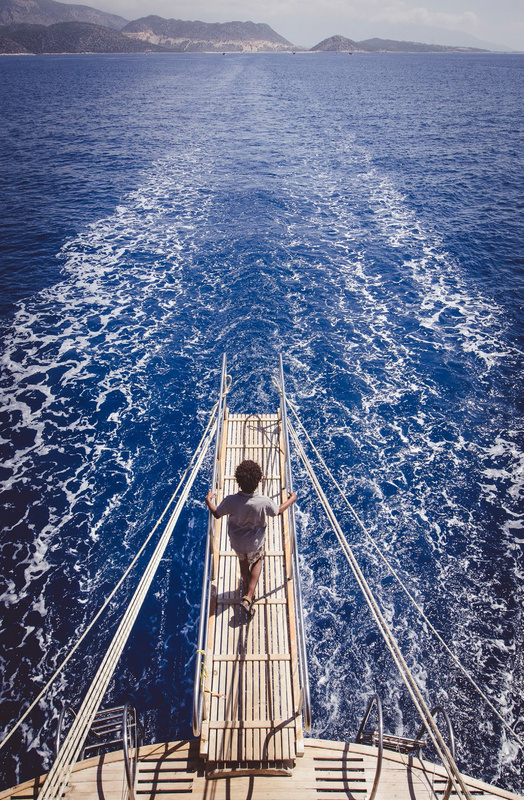 hiking and sailing. Lazy days spent swimming amongst Limestone cliffs and snorkeling sunken Roman ruins were followed with cold beers and the company of Turkish tourists escaping the grind of their respective cities. Göreme is located in Central Anatolia, Turkey. It’s fairy chimney spires with 2000-year-old underground cities and caves bring you back in time. 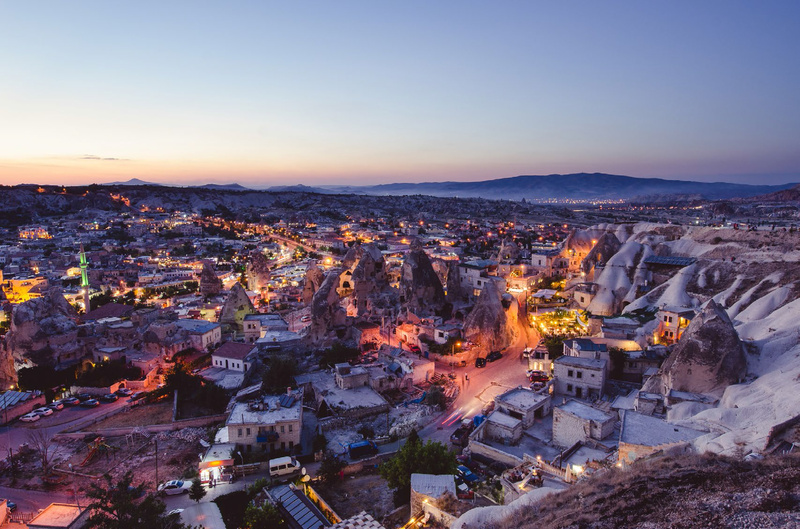 In fact, many of the caves are inhabited to this day, with most of the accommodations in Göreme being within these historical caves. Getting to Turkmenistan meant crossing the Caspian Sea aboard a cargo ship. This two-day journey brought us to the port town of Turkmenbashi, where after an all night interrogation, we were granted entry. After sleeping on the side of the road five minutes out of the port, we awoke to sleeping bags full of sand and a family sitting next to us intently watching. 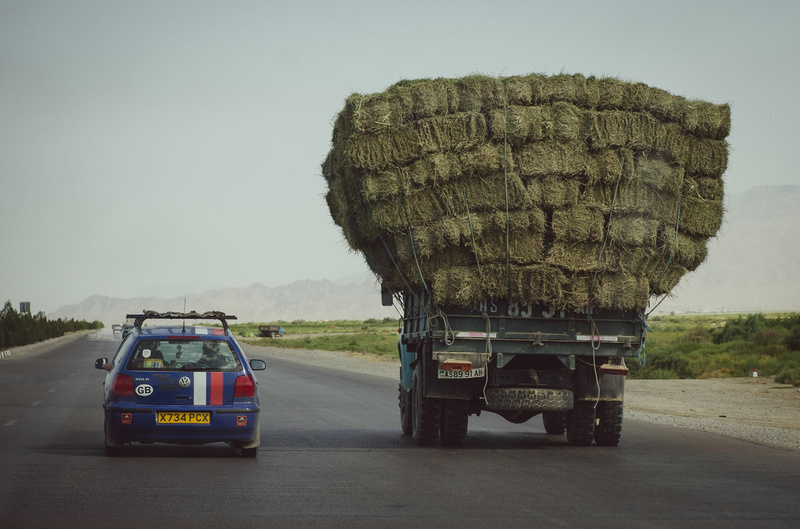 We met up with some fellow rally drivers in the strange capital city of Turkmenistan, all of us deciding that it would be much safer to cross the vast and lifeless Karakum desert together. Decent roads and truck traffic slowly give way outside the city to some of the worst roads in the world. The Karakum desert is a terrifyingly vast, desolate, alien moonscape, with the ever-creeping sands of the desert blowing across the road, slowly consuming it. The asphalt, feebly thrown over the changing landscape of the sand dunes, contorts and sinks under the mind bending heat, creating impassable ruts. On this day, we spent many hours digging our ill equipped vehicles out of the sand, some people suffering severe heat stroke. Massive flames shoot out of the ground ahead of us with biblical ferocity. 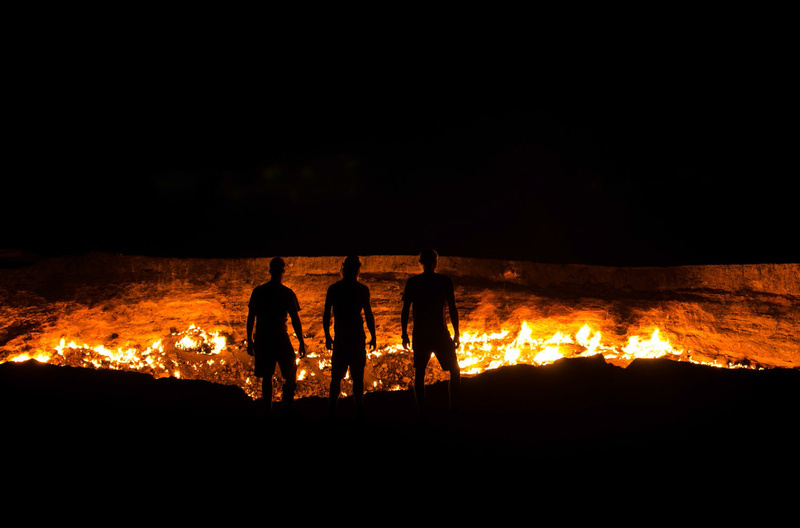 The “Gates of Hell” is a massive crater in the middle of the Turkmenistan desert that was created when a soviet oil rig hit a gas pocket in the 1980’s and caused an explosion, consuming the entire oil rig and creating a crater. This crater has been spitting towering balls of fire ever since. 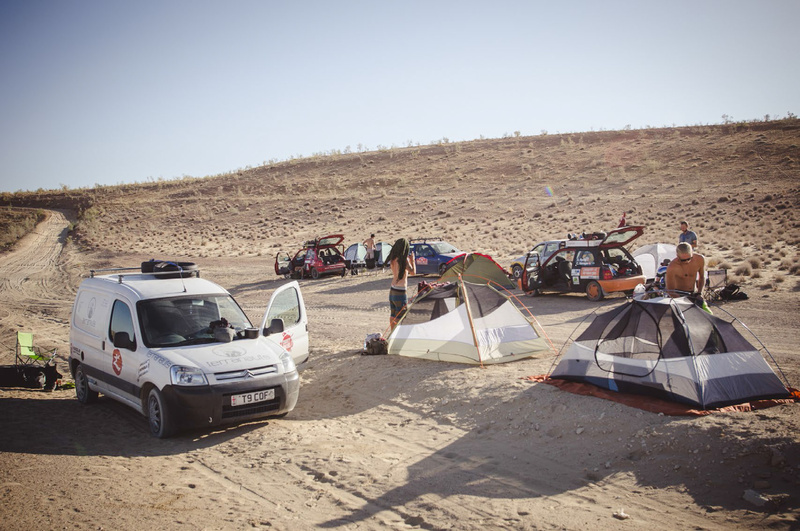 Seeing other rally racers out in the desert was a welcoming sight, we were all able to help each other cross the dunes and share dwindling provisions. Base camp that night was amongst spectacular sand dunes lit up by the full moon. 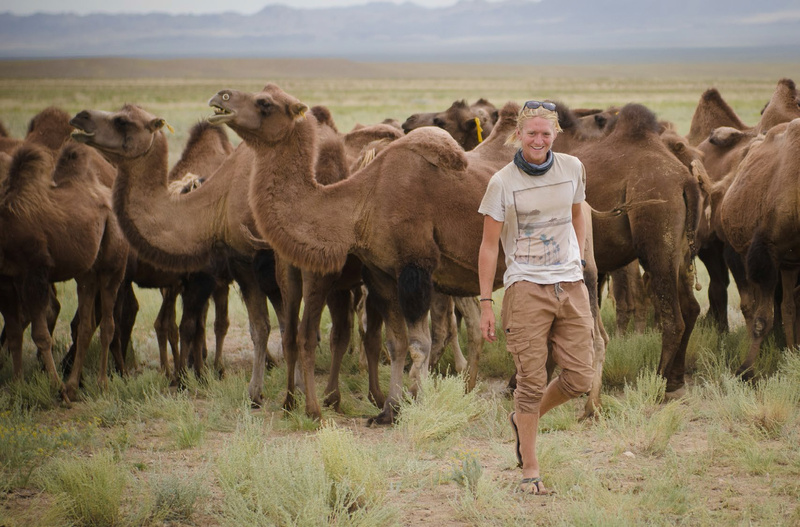 Mongolia is one of the most geographically remote places in the world and has few paved roads. 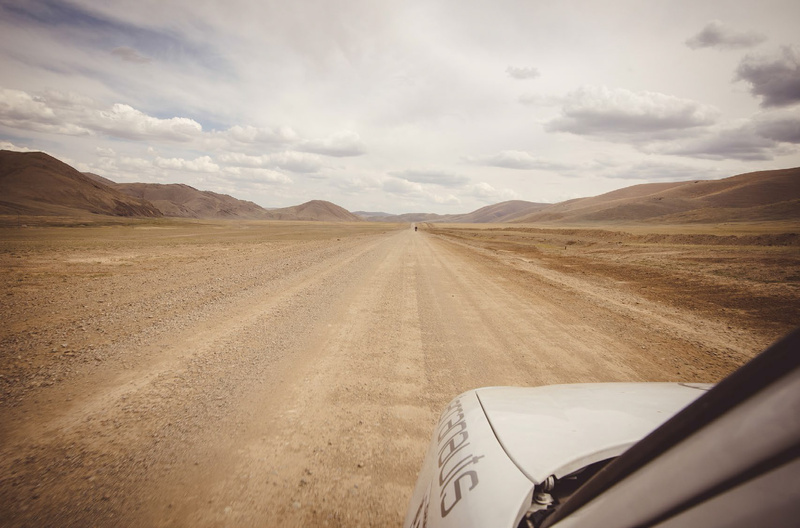 The roads from the border of Russia in Western Mongolia to the capital of Ulaanbaatar change every year depending on rivers, floods, washouts and where the nomadic Mongolians decide to go next. 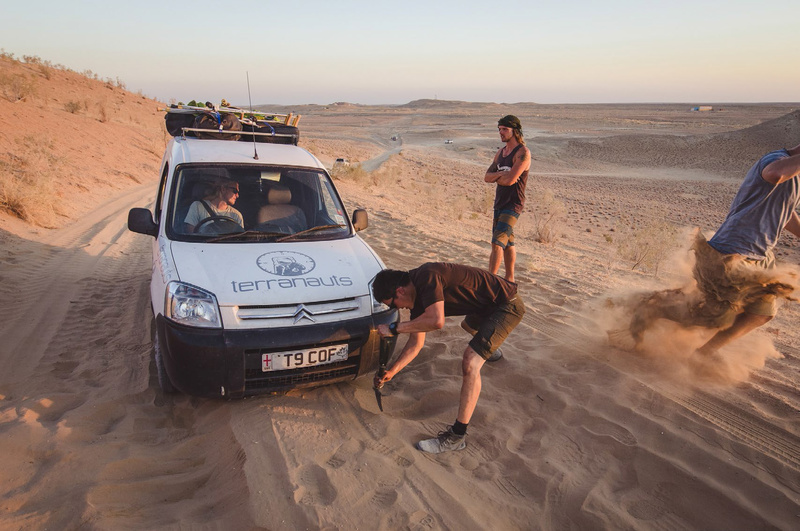 This is a daunting undertaking when you are in a small van not meant to be off-road and don’t have any GPS or electronic navigation of any kind. Relying on the compass and the odd nomad was all we had to go on. 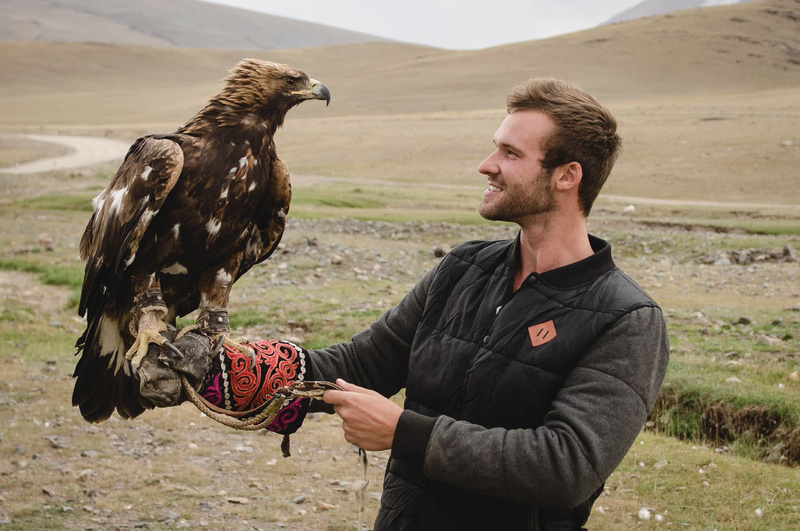 Some Mongolians still use the ancient practice of hunting with eagles and falcons. They ride through the mountains on horse back with the bird on their arm and hunt mostly fox. We had the incredible luck of running into one of these hunters in the Mongolian Altay Mountains. After sharing some fermented mare’s milk and boiled mutton, we were on our way. Yaks were a common sight in Western Mongolia, unfortunately so were river crossings. We managed to navigate most rivers with a combination of speed and luck. However, one river was deep enough to send water over our windshield and stall us in the middle. 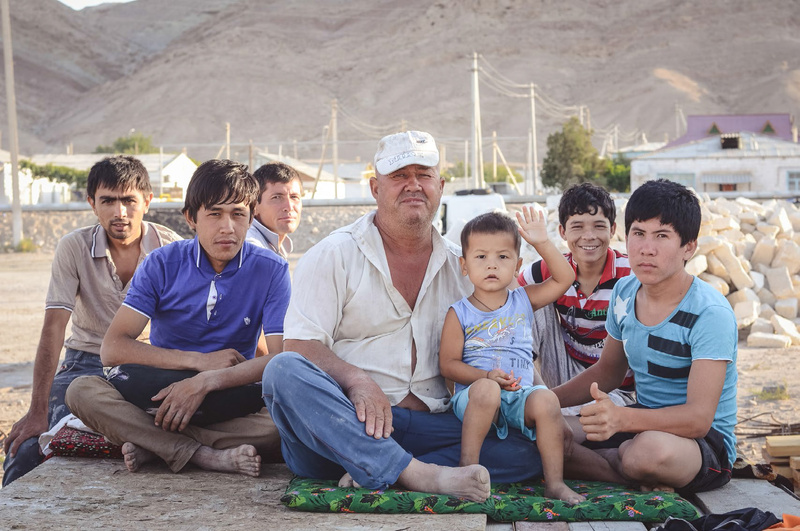 Luck was on our side that day, as a Mongolian family was sitting near the river and provided some help. The vastness of Mongolia is incomprehensible. Never had we seen a place so wild and open. At times we had to stop driving just to marvel in our place on Earth. A strong bond forms with those around you when travelling, knowing you only have each other to rely on. 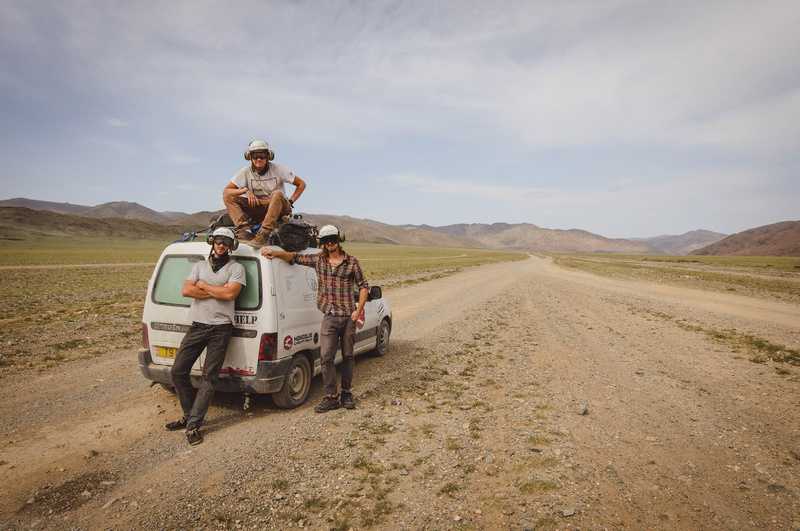 We destroyed five tires in Mongolia alone, leaving us stranded in the desert with no spares left. 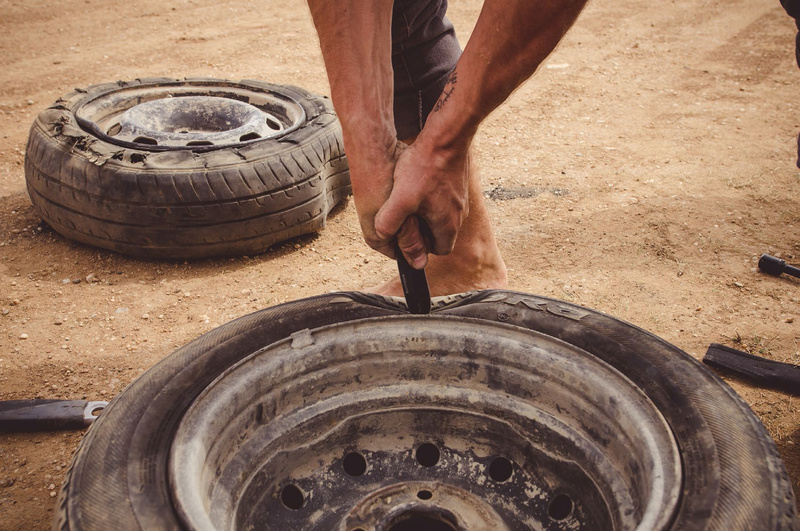 We had one tire left that wasn’t on a rim and the day was spent trying to remove the old tire and put a new one on with only a pocketknife. Needless to say, we were not successful. We drove 100 kilometers on a bare rim until we found someone to give us a ride to the nearest outpost. Here, we witnessed how a tire is inflated on a rim Mongolian style: by pouring gasoline in the tire and exploding it onto the rim.